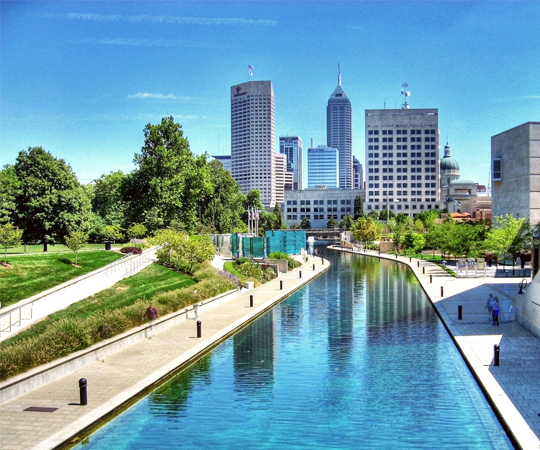 The largest city in Indiana, and the 12th largest in the nation, Indianapolis has a population of nearly 843,400, according to 2013 U.S. Census estimates. Demographically, the population is roughly 62 percent white, 27 percent African American, 9 percent Latino, and 2 percent Asian. 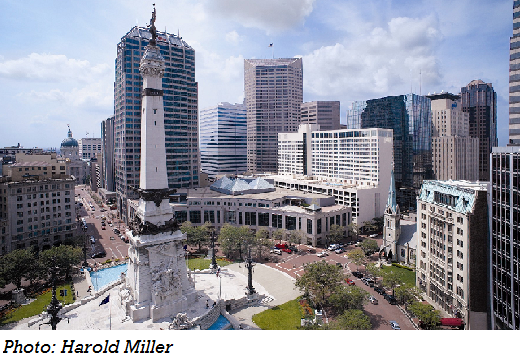 Selected in 1820 as Indiana’s capital because of its central location, Indianapolis quickly grew throughout the first half of the 20th century due to its expansive network of roads and railways. It became an automobile manufacturing center, rivaling Detroit, and a major hub of regional transport. Similar to other industrial cities, Indianapolis experienced industrial loss and suburbanization through the second half of the twentieth century, while the central city suffered. Population statistics, however, mask these trends, as in 1970 the governments of the city and most of surrounding Marion County consolidated—the resulting entity, coined “Unigov,” enlarged the city's population by nearly 270,000 residents. While population fell six percent in the decade following Unigov’s creation—a loss of over 40,000 people—city population has since recovered. Unlike most Midwest cities, Indianapolis enjoys a higher population today than at any time in its history. The incorporation of some suburban areas into the city has also eased the financial challenges that many other former manufacturing hubs have faced. Still, Indianapolis faces serious challenges. According to a 2014 Brookings Institute study, the Indianapolis metropolitan area has one of the fastest growing poverty rates in the nation. People of color are disproportionally affected—while white residents face a poverty rate of 14 percent, African Americans face a 31 percent rate, and Hispanics face a 42 percent rate. With a black-white dissimilarly score of 64.5, Indianapolis is also considered one of the most segregated cities in the country, resulting in neighborhoods with high concentrations of poverty and related challenges. Fortunately, Indianapolis is home to many community wealth building organizations and initiatives. For example, Southeast Neighborhood Development (SEND) has invested more than $35 million in Indianapolis' southeast neighborhood since 1991, enabling the community development corporation to support the repair, renovation and restoration of hundreds of homes. In addition, SEND has helped create or improve several parks, and has provided hundreds of youth with job training opportunities. Similarly, aiming to increase affordable and sustainable housing opportunities and catalyze neighborhood development, in 2012 the Indianapolis Neighborhood Housing Partnership (INHP) invested in or leveraged more than $22 million in mortgage financing and graduated over 3,000 people from its financial and homeownership classes. Working primarily with minority populations, Indianapolis’ Business Ownership Initiative (BOI) offers free one-on-one business coaching, access to financing, business workshops, and online courses—counseling nearly 450 people, and training more than 400 people in 2012 alone. The city’s largest public university, IUPUI (Indiana University Purdue University Indianapolis) has been a national leading in adopting an anchor mission to its work, helping to consistently support community economic development for the past two decades. The Great Indy Neighborhoods Initiative mobilized over 300 residents in six neighborhoods in 2008 to create quality-of-life plans that address a range of issues, including housing, public safety, economic development, health, education, civic and youth engagement, and the quality of the built environment. Established in 1997 as a partnership between Marion County’s The Indianapolis Foundation and Hamilton County’s Legacy Fund, the Central Indiana Community Foundation aims to improve the lives of Central Indiana residents. The Foundation holds assets of over $700 million and awards more than $40 million in grants each year to Central Indiana nonprofits. In 2004, it launched its Family Success program, which aims to break the cycle of poverty through direct services, network building, and policy work. As part of that initiative, the foundation supported the creation of Centers for Working Families, seven neighborhood-based sites where people can access employment services, financial literacy and coaching, and asset-building programs. Founded in 1925, The Children's Museum of Indianapolis is a nonprofit committed to creating family learning experiences that transform the lives of children and families. It is also committed to serving Indianapolis’ communities, demonstrated by the resources and time it invests in its surrounding neighborhoods. For example, in 2001, it created a Neighborhood Improvement Fund, which includes a $2 million revolving loan fund to support collaborative neighborhood projects. In 2004, it catalyzed an on-going housing rehabilitation and new construction project focused in its bordering neighborhoods, which has, to date, resulted in the rehabilitation and construction of 40 homes, demolition of 50 vacant properties, and repair assistance for 100 houses. It also played a lead role in managing the redevelopment of an abandoned hospital near its campus, which resulted in a new affordable housing complex with 50 units. Based in Indianapolis, Community Health Network (Community) is a nonprofit healthcare system with 200 sites across central Indiana. Since beginning to conduct Community Health Needs Assessments in the 1990s, Community has recognized the importance of addressing social and economic factors that impact health. One initiative is Project Search/Indiana, a high school transition program for students with disabilities that provides participants with worksite-based training. Initiated in 2006 with an investment of $92,000, Community also supported an Individual Development Account program designed to help area residents build assets through matched savings. To promote nutrition, Community sponsors farmers’ markets in neighborhoods and within its hospitals, helped develop the Community Heights garden where it maintains a medicinal herb garden, and provided technical assistance to the Indy Food Co-op, which opened the city’s first community-owned grocery store, Pogues Run Grocer, in a food desert at the end of 2010. Crooked Creek Community Development Corporation focuses on improving housing, public infra­structure, and commercial areas for people who live, work, and visit northwest Indianapolis. Its housing program acquires and renovates foreclosed single-family properties, converts vacant, substandard properties into accessible homes for community residents with disabilities, and provides no-cost homeowner repair services. To bring local, healthy food into the community, the CDC established the Crooked Creek Community Farmers Market in 2012, which matches purchases of up to $20 for those participating in the federal Supplemental Nutrition Assistance Program, and runs a community garden where residents can pick vegetables. To ensure a strong center for the community, it created The Hub, a facility next to its offices open to all residents and businesses that includes a gallery for local artists, a resource center, and drop-in office and meeting space. Established in 1985, Mapleton-Fall Creek Development Corporation (MFCDC) works in partnership with residents and community groups to serve, revitalize, stimulate and invest resources in an affordable, safe and vital Mapleton-Fall Creek community. To do so, it constructs and rehabilitates homes; develops affordable housing, parks, and public spaces; and offers a range of programs and services focused on community building and economic development. Aiming to help revitalize its Central Avenue corridor, MFCDC is currently developing an intergenerational senior housing project that will include nearly 19,000 square feet of retail space, at least 150 market rate and affordable housing units, a 8,500 square foot community center, and computer center. Committed to sustainable development principles, MRCDC uses LEED for Neighborhood Development, a rigorous set of green building and sustainable development standards created by the United States Green Building Council, as a roadmap and benchmark in all neighborhood projects. Established in 1988, Indianapolis Neighborhood Housing Partnership (INHP) aims to increase affordable and sustainable housing opportunities for individuals and families and serve as a catalyst for the development and revitalization of area neighborhoods. To do so, INHP offers homeownership education, financial and mortgage advisory services, and a variety of affordable mortgage and loan options for those buying or improving homes. In 2012, INHP invested in or helped leverage more than $22 million in mortgage financing; closed 376 mortgages or grants for home purchase, improvement or repair; and graduated over 3,000 people from its classes. Based in Indianapolis, the Indiana Cooperative Development Center (ICDC) works to promote cooperatives as a vibrant model to address the economic and social needs of Indiana’s communities. To do so, ICDC educates the public about the co-op model, identifies and shares information about best practices for cooperative organizations, and brings cooperatives together to network, collaborate, and participate in educational and training opportunities. ICDC also provides free services, including strategic planning; market analysis; business plan development; board, management and staff training; and fundraising assistance, to all types of cooperative organizations. Established in 1935, the Indianapolis-based Indiana Electric Cooperatives (IEC) was the first electric cooperative service organization created in the U.S. Today, the enterprise supports 39 member electric cooperatives located across Indiana. Its services aim to provide electric cooperatives the tools and resources they need to operate safely, efficiently and legally, and include job and safety training, advocacy and government relations, regulatory compliance support, and professional development training. IEC also runs numerous programs for students to learn more about energy and the cooperative business model, including a youth energy summer camp. The Indianapolis Neighborhood Resource Center (INRC) provides training, support and a variety of programs to help grassroots neighborhood organizations and neighbors address issues that affect the quality of life in their neighborhoods. The organization’s work is based on the Asset-Based Community Development (ABCD) framework, which seeks to highlight community strengths and provide a structure for transformation based on those assets. Its programs includes training sessions and individual coaching to help nurture grassroots leaders, “courageous conversation” events to provide a safe place for difficult community dialogues, and roundtables to provide a forum for community groups to connect on a regular basis. Founded in 1942 with just two employees, Katz, Sapper & Miller (KSM) became an employee-owned accounting, tax and consulting company in 2000. Headquartered in Indianapolis with satellite offices in Fort Wayne, Indiana and New York, the firm’s nearly 300 employees serve a wide range of specialized industries, including start-up companies and not-for-profit organizations. KSM also provides business, tax, accounting and valuation services to other employee-owned companies, and supports businesses considering implementing ESOPs from the initial feasibility study phase through the conversion process. Based in Indianapolis, Green B.E.A.N. is a food company committed to making healthy and sustainably grown local food affordable, accessible, and convenient to Midwest communities. Its name, Green B.E.A.N., was chosen to reflect its core initiatives: Biodynamic, Education, Agriculture, and Nutrition. Green B.E.A.N. encompasses Green B.E.A.N. Delivery, an online service through which members can order fresh produce and groceries from local farmers and artisans, and Tiny Footprint Distribution, a low carbon footprint company that distributes locally made food products to retail stores. Committed to low-income areas, Green B.E.A.N. has partnered with Indiana University Health to deliver fresh, affordable fruits and vegetables year-round to neighborhoods of need throughout Marion County, Indiana. The company also runs a “constant can food drive,” which takes any food members leave in their delivery bins to local food banks, and has itself donated over 100,000 pounds of fresh food to food banks over the past three years. Founded in 2009, Growing Places Indy is a nonprofit organization focused on empowering individuals and communities to “Grow well, Eat well, Live well and Be well.” To do so, it cultivates “networks of connection” by engaging individuals in urban agriculture, relationships with local farmers and local food, experiential learning, and practices for living well such as yoga, meditation, and urban bicycling. Its programs are run out of its 7 urban micro-farms located throughout the city, where Growing Places grows 60 varieties of fruits, vegetables and herbs each year. Growing Places donates a portion of its harvests to other community-based organizations. Indy Urban Acres is an 8-acre organic farm located on an undeveloped, urban property owned by Indy Parks, the municipal entity responsible for operating and maintaining the city’s parks and recreation facilities. The farm aims to provide low-income city residents with healthy fruits and vegetables, and to serve as an educational resource for user groups, community organizations and youth programming. To meet these goals, Indy Urban Acres donates 100 percent of the fresh fruits and vegetables harvested to local food pantries, and offers numerous tours, workshops and other educational programs that engage several thousands of community residents each year. Founded in 2011, Urban Patch is an Indianapolis-based, family-owned enterprise with a mission of making the American inner city better. It relies on a holistic model of social, environmental and economic community development and a “past forward” approach, meaning that it aims to build on the legacy of a community’s past in building strong and resilient neighborhoods today and into the future. Current projects include The Stone Soup Kitchen, which is creating a series of classes and to teach community members “garden and seasonal nutrition” and how to can and preserve produce, and the Leslie Allen Urban Apiary, which will produce honey, other bee products and lavender while providing open community space. Based in Indianapolis, RecycleForce is a nonprofit that provides low and no cost comprehensive recycling services across Indiana. It sells the scrap metals and other reusable materials that it collects, and uses the revenues to support job training programs, employment opportunities, and supportive services for formerly incarcerated men and women. With a staff of two when the enterprise opened in 2006, it now has 125 hourly workers and 20 salaried staff, and is credited with processing more than 28 million pounds of material since its inception. In 2013, the enterprise generated over $6 million in revenue, of which 31 percent came from recycling sales. Created by the Indianapolis Office of Sustainability in partnership with the McKinney Family Foundation, the SustainIndy Community Grant Program awards grants of up to $10,000 to support local initiatives that further economic development, ensure environmental integrity, and promote social and cultural vibrancy. The program specifically targets the grassroots level—i.e., people and groups focused on sustainability, but lacking the tools they need to get started or the capacity to pursue state or federal funding. To date, the program has held two grant rounds, funding a total of seven projects, including a community nature playspace, community garden, and an employment training program for women ex-offenders. Established in 2001, Indiana University-Purdue University Indianapolis’ (IUPUI) Center for Service and Learning (CSL) works to bring together Indianapolis residents with the students, faculty, and staff at IUPUI to improve people’s lives. As a partner in the Great Indy Neighborhoods Initiative (GINI) project, a citywide collaboration for holistic neighborhood revitalization, CSL participates in housing, public safety, beautification, business and economic development, education, health, and civic engagement initiatives that have been identified by the Near Westside community. For example, a faculty-led student team partnered with Near Westside nonprofit groups to design the expansion of and new building for a community center. CSL is also recognized as a leader in promoting and supporting community schools.